Financial services organizations have a unique relationship with technology: electronic data and transactions are the core of this industry. 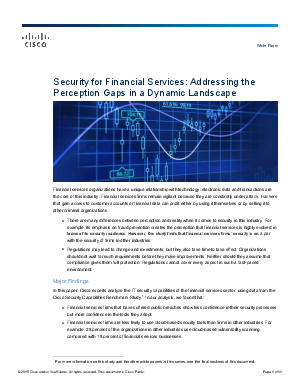 Financial services firms remain vigilant because they are constantly under attack. Hackers that gain access to customer accounts or financial data can profit either by using it themselves or by selling it to other criminal organizations. There are many differences between perception and reality when it comes to security in this industry. For example, its emphasis on fraud prevention creates the perception that financial services is highly evolved in terms of its security readiness. However, this study finds that financial services firms’ security is on a par with the security of firms in other industries. Regulations may lead to change and investments, but they also take time to take effect. Organizations should not wait for such requirements before they make improvements. Neither should they assume that compliance gives them full protection. Regulations cannot cover every aspect in such a fast-paced environment.